The Canadian real estate bears are coming out of the woodworks. 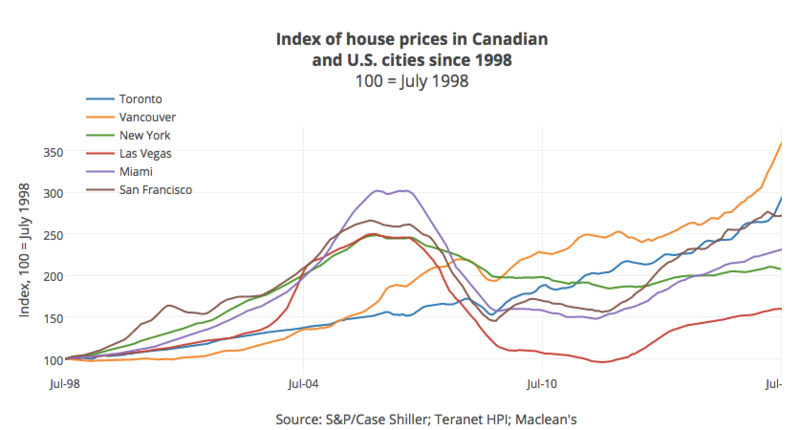 More and more evidence continues to mount between the frightening similarities between the US housing bubble of 2006-2008 and the current situation playing out in Canada. 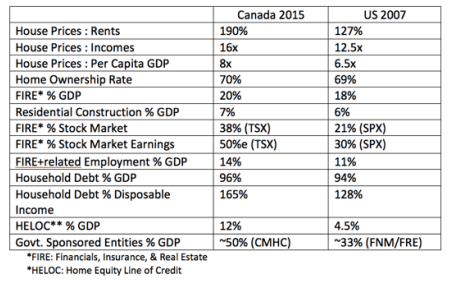 Last week Andrew Hepburn of Maclean’s wrote a piece titled Canada’s Housing Bubble Makes America’s Look Tiny. I’ll be referencing some of his findings as well as adding a few things I’ve stumbled upon lately. It all starts with household debt levels. Canadian household debt levels are now higher than the United States was back in 2007. As of September 2016, Canadians owed $1.68 in debt for each dollar of their disposable income. For comparison this is much higher than the United States peak debt levels of $1.28 back in 2007. With Canadian debt levels so high and virtually spending every penny to try and keep up with mortgage payments, Canadians can no longer take on more debt. Even lowering interest rates at this point will essentially be pushing on a string. Hence recent government action to cool housing prices. Which brings us to the next question, just how important is real estate for the Canadian economy? Residential real estate recently reached an all time high of 8% of total Canadian GDP. Residential real estate as a percentage of GDP is now higher than the United States was back in 2007. The Canadian real estate industry is also responsible for an unhealthy amount of jobs. As prices went up and irrational exuberance kicked into high gear it spurred record construction starts. Price increases followed and have now increased more than New York, San Fransisco, Miami, Los Angeles and Las Vegas even during their housing boom. But what happens if real estate slows down? Even a slight slowdown in the real estate industry could have a huge impact on the Canadian economy. Perhaps the most mind blowing stat out there; housing ownership transaction costs represented nearly 21% of total GDP growth post-2014. The Canadian economy has positioned itself poorly depending largely on the real estate industry. Even more so than the United States back in 2007.